Higher crude oil prices are on the way, if these projections prove to be accurate. OPEC has been doing something of a victory lap lately as officials from around the cartel predict the bottom in oil prices. Qatar's Energy Minister, Mohammed Al Sada, said last week that oil prices have bottomed, Ecuador's President Rafael Correa wondered if oil prices may stay too low too long, and even the U.S. Energy Information Administration has predicted that prices will begin to rise before the end of 2016. The reason so many high-level people are seeing a bottom in oil is the rebalancing of supply and demand. Booming supply from U.S. shale and Canadian oil sands is what caused the market's oversupply in the first place, but that trend may be reversing. Here's a look at why oil will likely head higher in 2016. The first part of the equation I'll look at is demand. You can see from the chart below that demand for oil in the U.S. struggled from 2007 to 2012. In fact, U.S. consumption actually peaked in 2005, not coincidentally the same year its oil imports peaked. But low oil prices and a strong economy have led U.S. consumers to rush out and buy SUVs once again, and when this is combined with growth in China (albeit slower than expected), the EIA is expecting demand growth in 2015 and 2016. The growth numbers aren't big, but they're important to the supply and demand imbalance that currently exists, which I'll cover below. Stronger demand for oil is one thing that will push prices higher, but it won't have much effect if supply continues to grow at breakneck speed. Since the first quarter of 2013, non-OPEC production growth has exceeded consumption growth, leading to oversupply of oil and the low prices we have today. But if EIA predictions below are correct, consumption growth will outpace production growth in the second half of 2015 and for all of 2016. Demand growth outpacing supply growth would be great for oil producers. And what's driving the reduction in production is what has OPEC so pleased. The U.S. and Canada were almost entirely to "blame" for the oversupply of oil recently (which I covered in depth here), and OPEC has indicated that it's not willing to give up market share to keep oil prices at the levels required for profitable U.S. and Canadian oil production growth. So, North American producers will need to cut production for prices to recover. As you can see below, that's expected to happen in a big way in 2016. 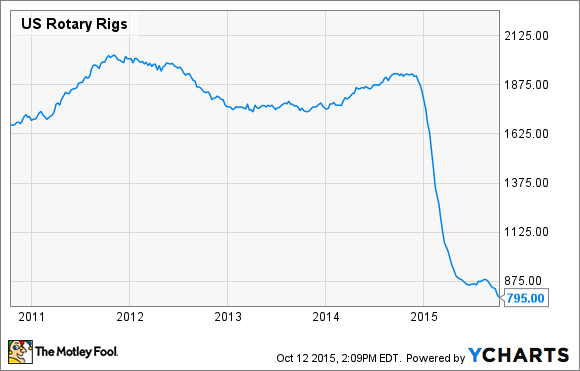 The reason U.S. oil production is going to shrink in 2016 comes down to the level of drilling happening today. You can see in the chart below that drillers have cut activity rapidly, and the current number of rigs won't replace the depletion at completed wells. US Rotary Rigs data by YCharts. If oil prices stay low, this trend will continue and we could see a long-term decline in U.S. oil production. That's a huge reversal from the boom that happened between 2005 and 2014. Oil demand is rising and supply is falling, but there's still a lot of inventory that needs to be burned off before market forces can push oil prices higher. If you're OPEC, the good news is that U.S. inventory is starting to decline and is expected to continue declining in 2016. This may be the last piece of the puzzle holding oil prices back from a big increase. When inventory gets back in line with historical norms, and supply and demand normalize, the days of $40 oil will be over. We're not in for a sharp rise in oil prices today or tomorrow, but look a few years down the road, and all of the signs are there that OPEC's plan to strangle U.S. oil shale is working. And with drivers buying bigger, more fuel-hungry vehicles, the demand side of the equation is working in their favor as well. These five charts show that higher oil prices are only a matter of time.